The LORD giveth, the computer taketh away! Praise the LORD! It took the Holy Spirit and yours truly over an hour this morning to write today’s Glory Seed and in less than a minute it was gone! And not only today’s writing but July, August and up to today went with it! Where it went is beyond me I searched, I prayed, I searched, I prayed all to no avail. Some little “byte gremlin” snatched it and took them into the great abyss beyond our known and not known world. The entire incident left me thinking about how fragile life is and how easy not only our loved ones but all our life’s work as well. I’ve tried as best I can to rewrite today’s Glory Seed. Recently I was able to watch a 1956 black and white movie titled “Earth vs the Flying Saucers” (you gotta love the special effects of yesterday) it was your typical science fiction movie where aliens from outer space threatened to (unsuccessfully) destroy all human life on earth. In one scene near the end of the movie the hero and some military brass were in a room when suddenly a voice broke across a speaker. “Attention people of earth. Attention people of earth. This is a voice coming to you from thousands of miles beyond your earth. Look to your sun for a warning! Look to your sun for a warning!” According to the movie script the voice repeated the message in every language for 12 hours over the entire earth. The voice, of course, is God’s voice and the message of the SON is scripted to your special circumstances. God always touches us at the point of our deepest need. For example a broken fingernail is probably not serious enough to attract God’s attention but a broken finger is a different matter. Your desire to win the lottery will probably not get a second look from God but genuine help in making your house payment is a different matter. It would be nearly impossible for me to list all the needs that exist in your life. To be honest I can’t really list all the needs in my own life because so many times I put my wants in my needs list. 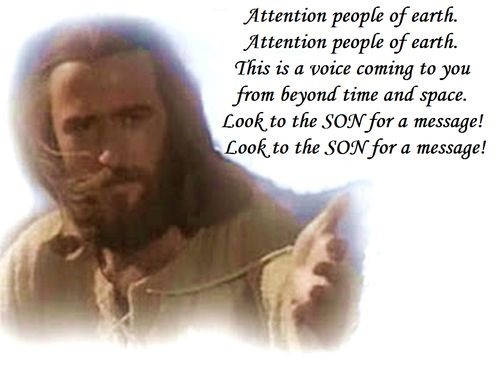 But in spite of all the things I don’t know about my life needs there one thing I do know I NEED THE SON and I know that I need to MAKE TIME every day to LOOK TO THE SON for a message!